Barbara is diagnosed with cancer and realizes that she doesn’t have long to live so she writes letter to her four daughters. 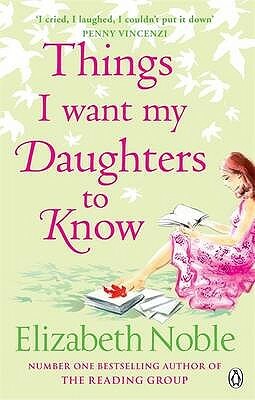 Each daughter has her own trials and tribulations going on in her life and Barbara feels each one might need some sort of guidance and sets about writing these letters and a journal for all four of them. Lisa is the eldest daughter who just cannot make a commitment in any kind of relationship. Jennifer finds herself trapped in a marriage that makes her defensive every time the topic of starting a family is concerned. Amanda is the footloose and fancy free daughter who is nomadic and always kept away from the family and then the youngest one is Hannah who is a teenager and finding herself amidst grieving her loss from a mother she would have loved to have around forever. There is also Mark, Barbara’s second husband who I found to be a fantastic stepfather and father, husband and friend. All of them are coming to terms with their loss, trying to cope and it’s an emotional roller coaster for every one of them. I really enjoyed this book and related to a lot of the parts in it. I have also resolved to also pay more attention to the journal I have for my children because I tend to write in it after months and months. Perhaps I will turn the months to weeks and then eventually make it a daily habit. Maybe!